Just look at SUPER COOPER! Big Air is the most common discipline of dock diving that people refer to. Consider this as the long jump of the canine world. 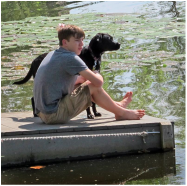 By throwing their favorite floating object, the dog travels down the dock, launches, and is measured by how far they jump. We measure from the end of the dock to where the base of the tail enters the water. Here is a link to an article on SportMutt.com "A Toy Motivated Sport". Tom Dropik is one of the pioneers of dockdiving and invented extreme vertical. Here is another article about how to motivate distance. 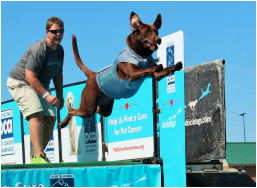 This sport is the high jump of the canine world. The run is shortened to get the maximum launch off the dock to grab the bumper. The bumper is the only object allowed in E.V. We will have a special rig at practice. Here is an article by Tom Dropik from SportMutt.com called "Motivate Height". Speed Retrieve (SR) is kind of like the 100 yard dash of the dog world.This event is about how fast the dog can get to the bumper. 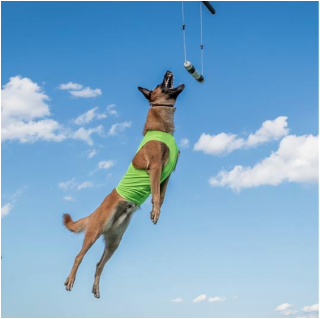 Unlike Big Air and Extreme Vertical where the dog does all the work, it takes both human and dog in this event. This is a family event and we love it when our youth take the dock! This is Harrison and his dog Pepper. He takes control of Pepper when they gets on the dock. They are an amazing team. If competing in an event, Youth Handlers must be between the ages of 7-15. We have lap dogs too!! We love to watch the little dogs jump! Remember you don't have to be the biggest jumping dog in order to compete. Dogs 17' or under at the withers are considered Lap Dogs.